This is a beautiful area with very diverse environments that include the bottom of the dry Ventura River, an oak forest, ridgeline chaparral, a great view of the Ojai Valley and Lake Casitas, meadows and an old orange grove. This area is seasonably accessible because you get to it by crossing the Ventura River, something you don't want to attempt in the winter months when it contains rushing water. Also, this being Ojai, it can get very hot in the summer so late spring and fall are the best times to visit. a. Riverview Trailhead and parking on Rice Rd. Take the 33 north from the 101 towards Ojai. At the intersection with Hwy 150 (Baldwin Rd), about 11 miles from the 101, turn left, then turn right after three blocks onto Rice Road. Watch carefully for Hwy 150 - it's not well marked. Once on Rice Road, drive north about 1.5 miles to the Riverview trailhead on the left, across the street from a large horse coral. It takes about 45 minutes to drive there from Thousand Oaks. Map and directions. b. Oso Trailhead and parking. From the Riverview Traihead, continue north on Rice Rd about 3/4 miles, then turn left onto Meyer Rd. The trailhead is at the end of the street. Map and directions. c. Old Baldwin Road Trailhead and parking. From Hwy 33 just south of Ojai, turn left on Hwy 150 (Baldwin Rd). Drive 0.4 miles and turn right on Old Baldwin Rd (If you cross the bridge over the river, you've gone too far). Drive to the end of Old Baldwin Rd., about 0.4 miles. Map and directions. Description There are a number of trails on the east bank of the Ventura River that connect the two northern trailheads and the three river crossings. They are generally pretty level, smooth and firm, but there are occassional short rocky sections. Not all of these trails are shown on the map above. Download the GPS track to help you find your way. Description To get to the Preserve trails you need to take one of these trails to get to the west side of the river. 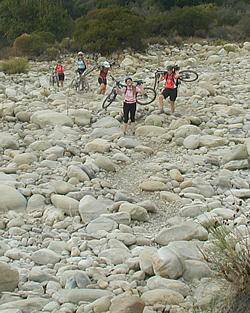 They go through the bottom of the dry riverbed, and they're rocky, sandy and, in the better sections, gravelly! 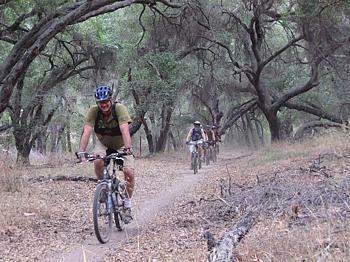 If you're riding, most people will push or carry their bikes for most of these trails. Special note: The West River Trail goes through the middle of the riverbed, not along the side of it, so it is an especially long challenge. They are all, however, mostly flat. Description This is a mostly ridgeline trail with some great views, particularly to the south. 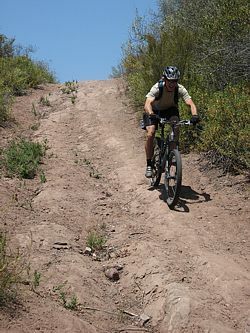 Being ridgeline, it has some steep sections that can get loose if it hasn't rained for some weeks. A very strong rider will be able to ride up most of the way, but this trail typically involves some pushing on the way up. Near the top, the trail turns away from the ridgeline and follows a very loose singletrack with a few switchbacks. At the top of the switchbacks is the Preserve Highpoint where there is a really great view of the valley to the south and Lake Casitas. From there it's a short way to the Chaparral Crest Trail. On the way down, this is a super fun trail to ride once you're past the loose singletrack at the top. 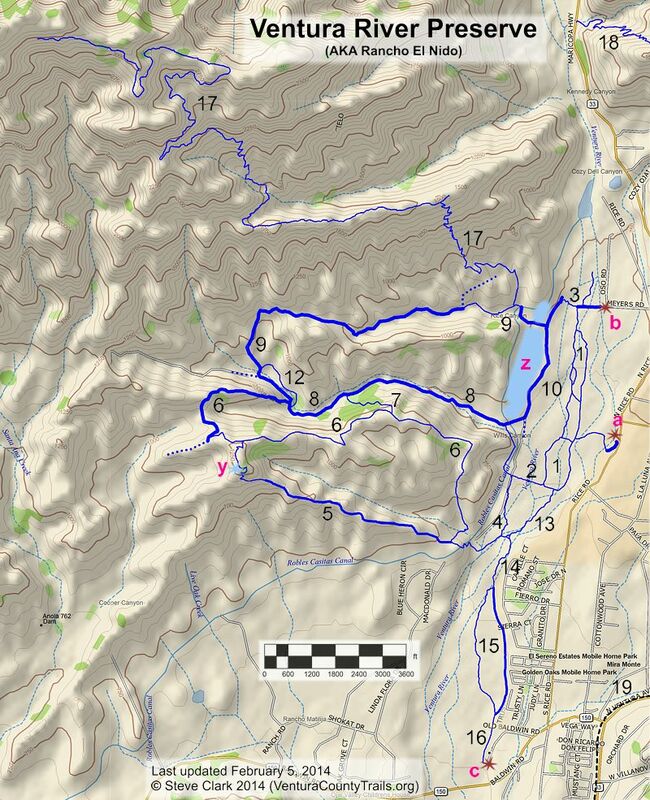 Description The Chaparrel Crest trail starts at the end of Wills Canyon with a fairly steep climb for a half mile. This section can be climbed on a bike, but it's a real challenge. After about 3/4 miles of mostly climbing, the trail makes a switchback left turn onto another road that comes in from the left (the first road continues straight, but that way is closed to the public). 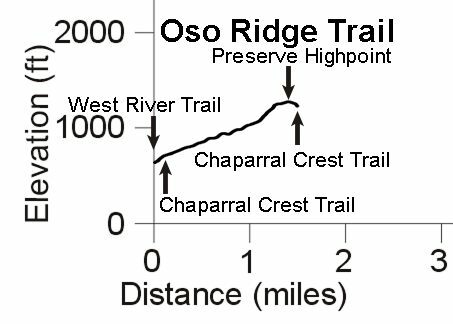 Near the top, the Oso Ridge Trail comes in from the south and from there this trail is essentially a ridgeline trail with a few short but steeper climbs and a very steep descent of a couple hundred yards. About 1.8 miles from the top of Wills Canyon, the Fern Grotto Trail drops back down into Wills Canyon. The Chaparral Crest trail continues down and joins the Oso Ridge Trail near the bottom. From the elevation profile below, it doesn't look like the lower section of the trail would be very difficult to climb on a bike, but the reality is completely different under the Ojai sun. If you think this trail is steep, see how it compares to other steep trails. Description This trail leads from the Chaparral Crest Trail down to Wills Canyon. The top is in the chaparral, but the bottom 2/3 is under the tree canopy of Wills Canyon and it makes for a very pretty and shady route. 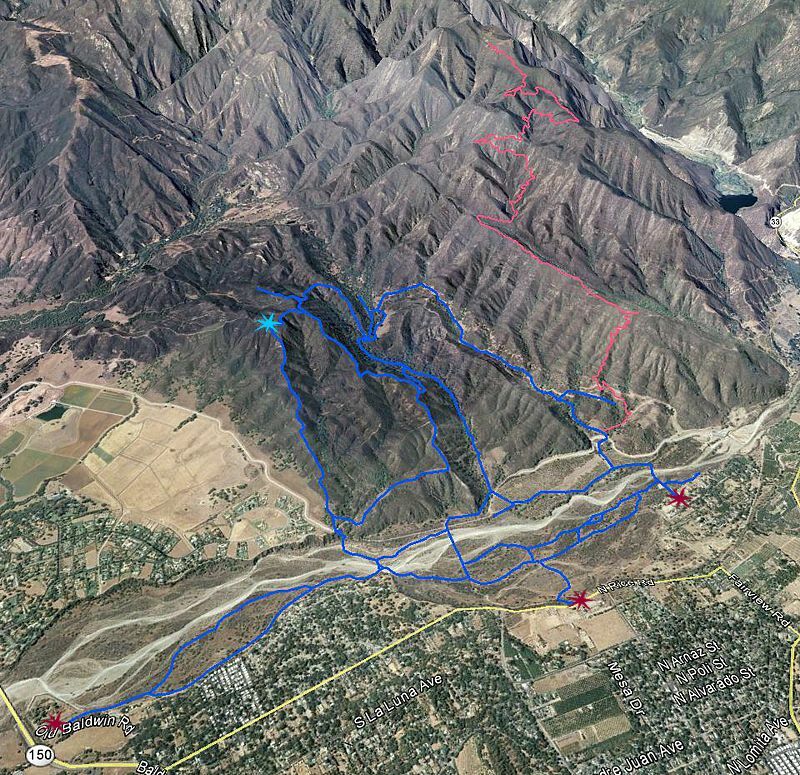 This is a really fun downhill for mountain bikers. 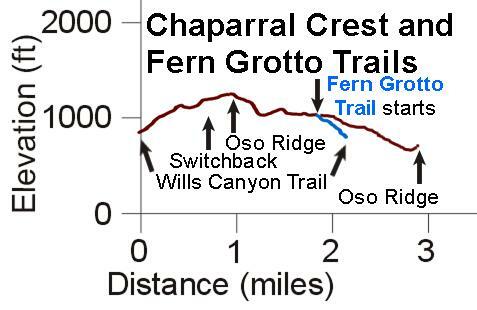 The profile is shown as part of the Chaparral Crest Trail profile, above. Description This is a beautiful old dirt road that has degraded to a wide and very easy singletrack. 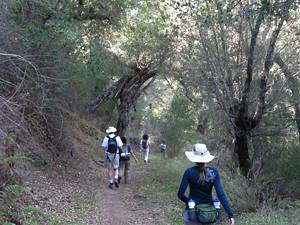 It goes through an old oak forest, but stay on the trail because there is a lot of poison oak under those trees! The trail starts at the end of the Wills Crossover (AKA mid river crossing). Cross the paved canal road to start on a singletrack that parallels the road, drops into a creek and then climbs steeply out. At the top of the creek bank, the Wills Canyon Trail is to the left (uphill) and the Orange Grove Trail is to the right. A lovely and easy loop to do is to go west up Wills Canyon, continuing up the ridge and over into Rice Canyon, down the fireroad and onto the singletrack, turning south on the Orange Grove Trail, finally bearing right through the orange grove to get back to the start of Wills Canyon. The profile below shows this whole loop. 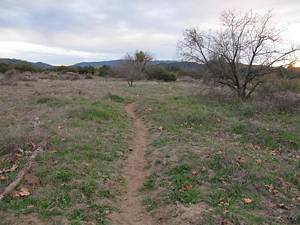 This is a great loop because of the gentle climb up Wills Canyon, the fun downhill in Rice Canyon which ends on singletrack, and then the River Bluff Trail runs along next to an abondoned orange orchard before running through the trees. The variety of surroundings on this loop is amazing! 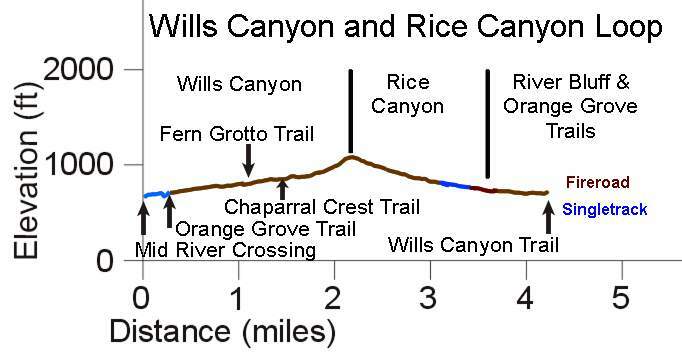 Description The exact starting point of the Rice Canyon Trail is a little uncertain, so for simplicity I have it starting when the trail starts to climb out of Wills Canyon at the Chaparral Crest Trail. The trail also becomes a proper fireroad, with a gentle climb at first and that gets a little steeper towards the top. At the peak there's a great view back down into the top of Wills Canyon. The road forward and down is a decent fireroad, perhaps a little loose and rocky in spots. 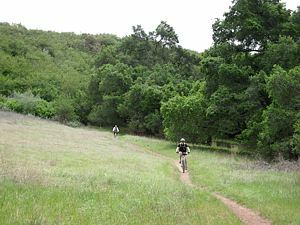 About 1.6 miles from the start of the climb out of Wills Canyon, the trail takes a sharp right turn off the fireroad and continues downhill on a singletrack, through trees and meadows before coming out at the canal. A small wooden bridge to the right leads to the Orange Grove Trail. Description This is a gravel and dirt road that descends gently from Rice Canyon, then bears right through the orange grove to get to the bottom of Wills Canyon. This is a very easy trail and a pleasant end to the Wills Canyon / Rice Canyon loop. Description This singletrack is a beautiful trail that connects the Wills Canyon Trail just south of the Chaparral Crest Trail with the Rice Canyon Trail just about where it starts to climb out of Wills Canyon. The trail starts at the little bridge bypass trail and has a bit of a rocky start with a very short climb, but then it becomes a smooth, leaf-littered trail. The forest here has very little undergrowth so everything seems very open. The trail soon emerges into a small meadow and meanders across before it joins up with the Rice Canyon Trail. This is one section you should not miss! Description This is a newer section of the Preserve, opened in 2011, connecting to the Old Baldwin Road trailhead. The eastern arm of the loop is along a wide grassy walkway that passes along the back of the neighboring houses. The western arm is a singletrack that meanders along the flood plain. There are several trails that connect these two halves of the loop, but they're not shown on the map. There is very little elevation change along these trails. Description This is a paved walkway that leads from the parking area for a few hundred feet. Description The Kennedy Ridge Trail is a work in progress. 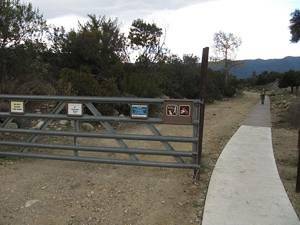 It starts in the Ventura River Preserve and climbs up to Kennedy Ridge, crosses down to Kennedy Canyon, then climbs to the old Camino Cielo road. This is where the work in progress comes in to play. 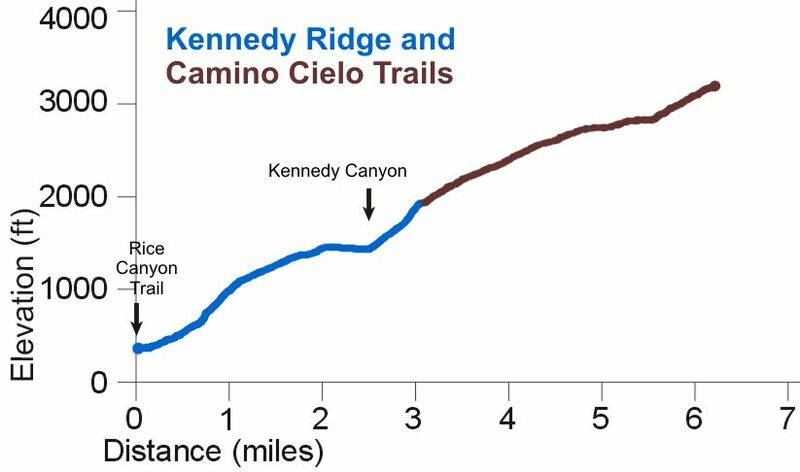 El Camino Cielo has 20 years or more of brush growing on it, so the trail is being extended north-westerly (uphill) one section at a time by cutting back the brush. Some sections are wide and clear, but others, not so much. Sections that are well cut back are interspersed with much narrower sections. Eventually the trail will connect with the Oceanview Trail and Divide Peak. Overall, the entire trail is very easy to follow and there are spectacular views as you climb higher. Several picnic tables have been hauled up and placed at good viewpoints. Most of the trail has a smooth, single-track width tread (T2 ) but on Camino Cielo, there are some rockfalls and screefalls that cover the trail (T4.5 ). 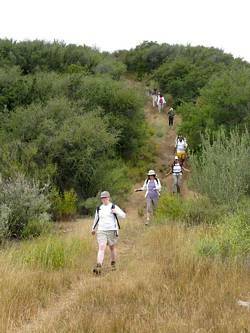 This moderatley steep trail is a great hike for intermediate and more experienced hikers. Even though it's open to mountain biking, it's really too steep, and in many places, too rugged to ride enjoyably. By the time you hike it, the sections that are a little narrow or rugged may have been fixed up and it may push all the way through to Divide Peak! View a Kennedy Ridge Trail photo Gallery. 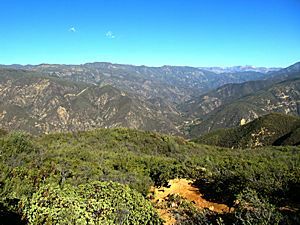 Santa Monica Mountains National Recreation Area (SMMNRA) and other locations.